I spent almost half of my day to install ruby on rails on my Windows PC. After a long fighting on installing, I found an EASY way for windows. Could be said as DAMN EASY. What you need to do is download the latest version from Rails installer site and run it. Don’t need to download Ruby Installer, as it is included inside Rails installer. What you need to do is waiting until it’s done. Then, open browser and go to http://localhost:3000 .If you are able to see the page. Congratulation, you are done with ruby on rails install. Last things is to download Aptana Studio 3. Caution here, make sure you install rails first instead of Aptana studio. Otherwise, you have to configure the path for rails on Aptana studio. 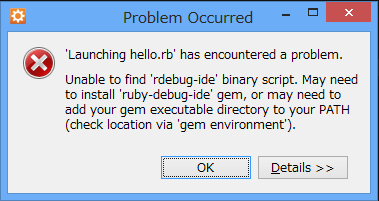 If you received error "Unable to find 'rdebug-ide' binary script. 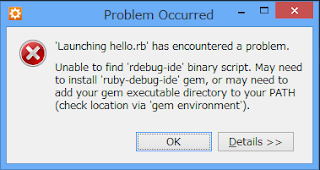 May need to install 'ruby-debug-ide' gem, or may need to add your gem executable directory to your PATH", when debug ruby in Aptana studio. Then, restart your Aptana studio. You should be able to debug ruby file. Okay! Hope you are already in coding. Thank you for reading. First, load the image from folder. Here's is the method I prepared. 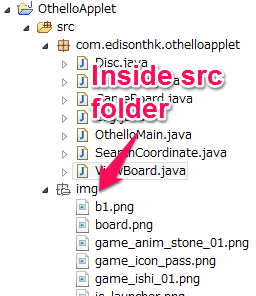 For eclipse IDE, I put my images file inside the src/img package. After load the image, let's say "image_want_chop.png" is loaded and chop it with following code. Our goal is to split the selected MySQL data into multiple pages and display current page and the data show on specify page. Let’s say the limit of data on single page is 10 rows, and current page is page 2. It means I need to show the data begin from 20th to 30th. So what I need to do is to set the offset value and length of data selected. To prevent sql injection, we need to modify the code above into bottom. Caution : According to stackoverflow, seem like there is a bug when using execute(array(“:offset”=>0)) or bindParam(“:offset”,trim($offset),PDO::PARAM_INT) without intval function. So it is better using what I given on above. I hope it works for your guys. You can test it by add ?page=0 to your end of the url. It will show you the first 10 rows data without offset. It is the last things we need to do. First get the total rows number from table. Then show the current page with special view and other pages with normal view. Here’s we done! Thank you for reading. I have migrate my blog to new site. Click link below to redirect. I have migrate my blog to new site. Click the link below to redirect. Beginner Question - What is SSCCE? For beginner programmer, you will found out this words comes out very often on java software developing forum such as stackOverflow. What does SSCCE mean? If you have looks at the SSCCE link. 5 big words is highlighted on the top of the page. And the following things is the content that filled with dozens of words to explain what does it means and why do we need to do it. Why do we needs to do so? No matter how well your English is, the best way to tell people what wrong on your code always is allow others compile you works and find the actual error. Pretend that you are developing Java Swing application and you are having problems of label is not showing on windows. Here’s the code provided. And the problems look like following. Maybe you might think that label is not showing because there is an error on your label code so you only post the part of the label. However, you wouldn’t be able to solve it if you only post label code. Let’s me show you why. Take a look at following whole code. If you tried to provide the compilable code instead of part of the code. We are able to help you find out what exactly you are having. From the source above, we can understand that the reason why label is not showing on windows is due to frame.add(label) is not added. There is no problems on label code. So if you are provided a part of the code, you wouldn’t be able to found out what exactly problems you are having. 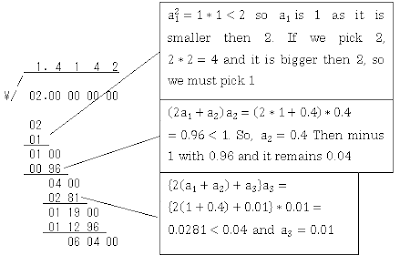 For those who are looking for how square root algorithm is working and “YES !, Welcome to my blog”, but for those who are simply looking for performing square root your programming and I have to tell you, what you have to do is do some google searching on “math.h” header file to look for square root function that prepared inside it. Left hand side of the diagram shows the square root of 152.2756 and right hand side shows the square root of 2. For those who have understand how this calculation is been done, please skip to the code as I am going to explain the how to solve this equation. Based on the question given above, we understand that square root of 152.2756 is 12.34 and the square root of 2 is 1.4142. If you do not believe, try calculator to find the answer. If we expressed it to algebra expression as following. Why I am treating it continue as n times but not 5 times? Because we cannot ensure that all positive number will give us a 5 digits answer after square root it. So we have to suppose there are n digits after square root. From the equation above, we can understand square root equation can be solved by following equation. The most important rule of this equation is we pick a number from 1,2,3,4,5,6,7,8,9 and multiple it with 10^m, where m = Integer (exp. 3,2,1,0,-1,-2,-3,...) and substitute into that must be smaller then the number we are going to minus or equal to it. It’s the most difficult part on square-root equation so lets understand it by solving square root of 2.
where rst and j is declared as double and i is int. powerOfTen is a function that return a value of i times multiple of 10.
where z is declared as double and treat as upper number. Same loop as above but this times we are going to find the decimal number. I am referring to this wiki website. For more details, please refer on this website. Thank you. Click here to download. The zip file contains 2 projects and 1 php file. I begin to learn programming is still half of a years ago and I begin to write this application is about one months ago. Begin from 0 knowledge to network and server. So I couldn’t make sure that I have wrote a very perfect program. 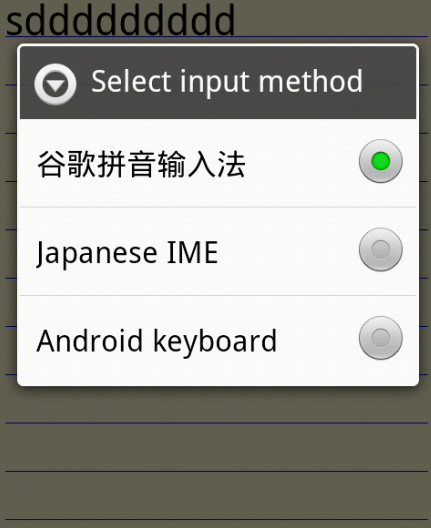 But, this application do exactly what I need for that is synchronizing between android and desktop. It is how it’s look like. Check it out with the following video. Picture above shows how the data is transferred. Database server is a bridge to allow data move from android to desktop and move from desktop to android. That’s all, simple right! Of course that’s other way such as cloud computing or others. Based on my knowledge, this is easier way I know. Because every software I used to develop this application is open-source, I spent a zero cost on this project. Flow chart beside shows how data is passing through between android and desktop. When user press a button on UI thread to ask android read what desktop have written, android will begin access to MySQL server. In server side, 2 php files ( update database and read database php files) is created and located at htdocs. After android will success to access into server, then android will begin searching the php files requested (either update or read php files) through HTTP protocol. Request ask for read database php file to work. When read database php file is executed, php file will begin it’s work by log in to database and retrieve the data requested that what desktop have written into database. After, php get the data it wants from database, it will pass it again to android and android get the data and put it on UI thread to show user what data have retrieved from database. 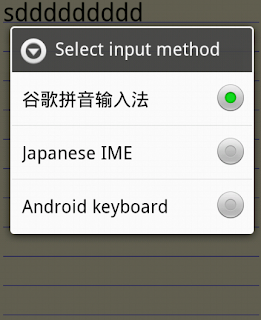 If the desktop ask for what android have written, it (desktop) will do exactly same things as what android did. desktop will going into database adapter request for data it wants. Then database adapter will log in to database server through Java-MySQL connector and search for what android have written into database. After database adapter get what their want, it will pass the data to desktop and desktop will put it on screen to show user what data it ( desktop ) got. JsonParser.java contains HttpGet method. There is no input data to url, only retrieve data from php file. JsonPost.java contains HttpPost method. This method allow data post into php file. MainThread.java is a UI thread work that called the button or textView method allow user talk with machine. mysqlDesktop is an java Swing project. Inside this project contains three java source code and one external jar that is DatabaseAdapter.java, jConnector.java and MainFrame.java and mysql-java Connector. jConnector.java contains the source code that allow java project connect to MySQL database. DatabaseAdapter.java used to make database work getting easier to carry out.